As this headline, In an Effort to Get ‘Cool,’ Microsoft Finally Calls in Crispin, came across my screen I had to saw “wow” as the Window’s Vista campaign had previously exclaimed. Now that the Sprint & Goodby saga has ended, this might be a good relationship to watch. Don’t get me wrong unlike Burger King, Miller Lite and Sprint, I actually really like Microsoft and the software that they have produced. Bill Gates, love him of hate him is a master mind to be respected. That said… Apple is so much cooler, right? 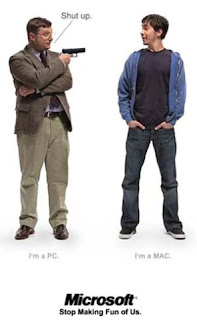 Steve Jobs vs. Bill Gates? You can watch a head to head panel discussion here on YouTube and decide for youself. Seriously though, I really want to see what comes of this relationship. I think if Microsoft continues to work on innovating and allows Crispin to be creative that something really cool and valuable just might be delivered.